How many "kinds" of bikes you are aware of? To this question, you may answer about bikes of various companies of different models and features and specifications. What I am asking is how many kinds of bikes you know that serves for different purposes. Do not get dumbstruck. You listened correctly. Don't confuse that how can a bike performs different functions. But it can. If you still don't believe me, follow up my entry. Though it is named as a bike, it is actually a cycle which can serves not only as a cycle but also as a shopping cart. To solve the problem of space and occupancy, Hyuk-Jae Chang puts forward the Ville Urban Folding Bicycle Concept. 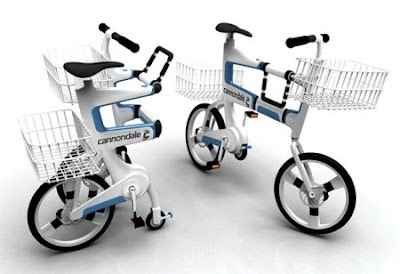 The vehicle, though named as a bike, can also be transformed into a shopping cart via simple folding. 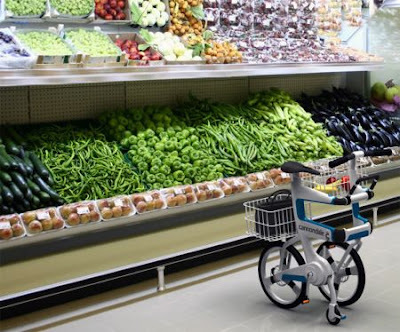 As a result, you can directly take the Ville into the grocery after you get there on the bicycle. 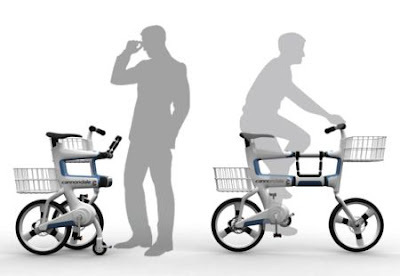 It is reported that the Ville has won the Bronze Prize at IDEA Design Awards 2010. Congratulations, Hyuk-Jae Chang!